On 3 July, 56 students in Year 4 at Park Mead Primary School were excited to receive copies of the Usborne Illustrated English Dictionary, courtesy of Cranleigh Rotary. The dictionaries were presented by the new Club President, Brian Arendell. 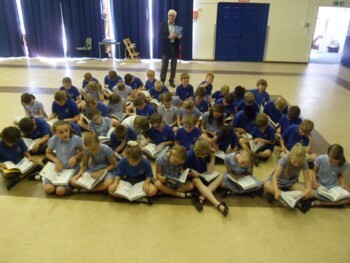 The pupils could not wait to delve into the books, and to have them signed by Brian. 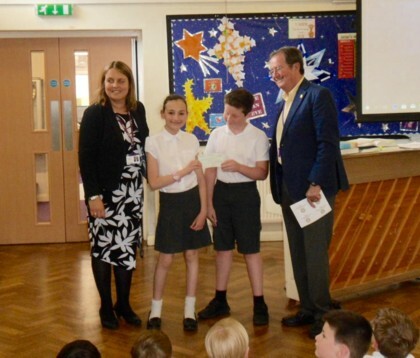 Previously, on 4 May, Cranleigh Rotarian Andy Kolmar attended the weekly assemblies of Cranleigh Church of England, Ewhurst Primary and St Cuthbert Mayne Junior schools in order to present each of them with a cheque for £200. For many years, Cranleigh Rotary has presented cheques or books (usually illustrated dictionaries) to local primary and junior schools, as part of its commitment to young people and the local community. The financial donations are given in order to assist the schools in purchasing new books for their libraries. (Top) Year 4 students at Park Mead Primary School can't wait to examine their new dictionaries, donated by Cranleigh Rotary. (Below) The headteacher, head girl and head boy of Cuthbert Mayne School, with Cranleigh Rotarian Andy Kolmar during the presentation of the cheque for new books.